Arnold Grummer's has the good fortune to showcase creative, original work by nationally known designers and artists. Follow along for fresh inspiration or search the archives for handmade paper projects for any occasion. June is the preferred month for weddings and I have seven to attend this month. 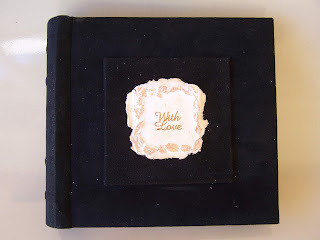 I found this photo album on sale and new it would make a perfect wedding gift. Lucky that the store had 10 of them….so I bought all and will make one for each of the seven June weddings and get a head for future weddings…you never know when someone will pop the question…smile. white slurry and cast one or more of the rose & leaf molds. 2.Allow the casting to dry. 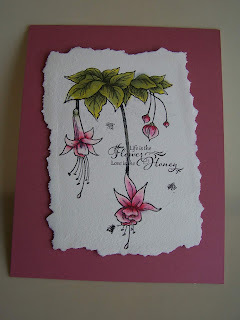 I loved the look of black ink on ivory handmade paper so much that I wanted to continue with the theme and the look! I needed some cards to cheer up two friends and had extra sheets of the medium to heavy weight handmade paper “planned” over from the last two paper making sessions. 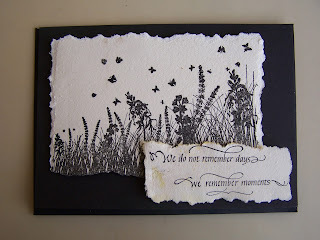 These two meadow stamps are perfect for the job and the “Moments” sentiment stamp from Quietfire Design was the perfect message. create white slurry and create several sheets of medium to heavy weight handmade paper. Welcome to the first ever Earth Day blog hop with the Arnold Grummer Design Team. We are excited to be participating along with other awesome organizations like the Earthday Network in bringing focus to an annual event that has become a week long celebration on "green" topics. And everyone knows that the Arnold Grummer organization is all about being green and the importance of recycling to create beautiful paper. One lucky winner will receive a Arnold Grummer's PAPERMILL Complete Papermaking Kit Enter to win by leaving a comment below. Then be sure to visit the other blogs in the hop and comment to win. The more blogs you comment on, the more chances you have to WIN! One winner will be chosen at random from all blog comments! My friend’s April 15th birthday is the reason for creating this beautiful floral piece. She is an avid gardener and grows the most beautiful flowers. With the help of a great stamp set from Stampendous® and a piece of handmade paper, the piece went together in rapid time. April is the month that we celebrate “Earth Day”. I have always wondered why everyday isn’t “Earth Day”. I think this is the perfect time to use two of the great Woodwear™ clear collage stamps. After much thought, I decided to not color anything. I love the simplicity of the black and ivory images. This paper turned out SO gorgeous! 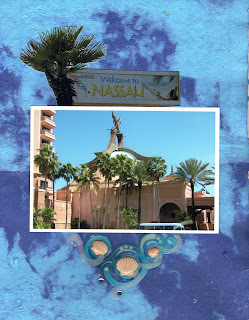 I will be making more to scrap my entire cruise to the Bahamas :o) It's so pretty, I didn't want to cover any of it up. 1. Make 2 different color blue batches of pulp. I put linter and iridescent flakes in both batches. 2. With your screen in the pan of water, add about 1/2 cup of each color. Have fun trying different placement of your blobs of pulp. Gently swirl together with a paint brush handle, lift out of the pan of water and proceed according to your kit instructions. 3. 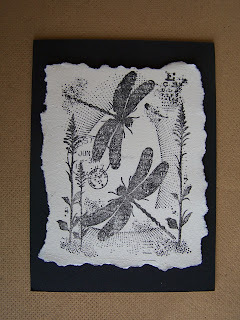 Using two 5.5 x 8" pieces of handmade paper, attach them to make an 8 1/2 x 11" background paper. Or, use the larger paper-making kit. Either way, trim the rough edges to size. 4. 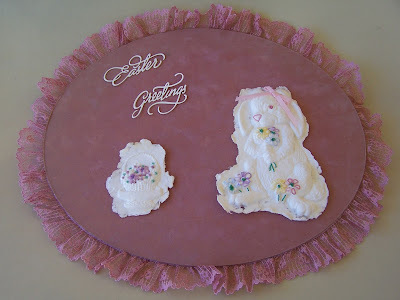 Attach photos and embellishments. Our weather is warming up and the trees are starting to blossom. Easter is just around the corner and I wanted to share this piece with you. It will be a gift for one of our neighbors grandkids who always share their Easter eggs and candy with us.